I have a very difficult time charging my iPhone. Something’s wrong with the port or something, because I have to literally hold the charging cable in place in order for it to register. 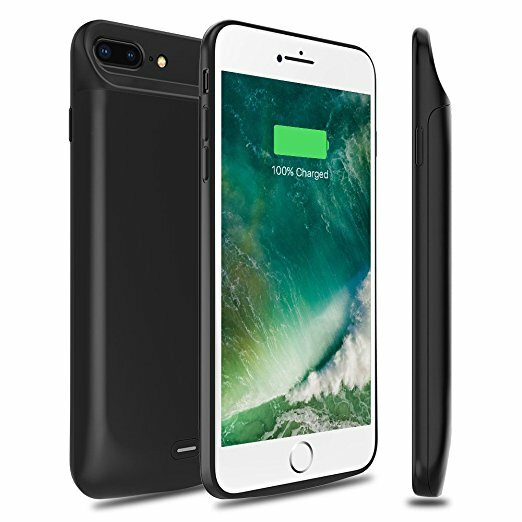 That nuisance, plus the very short lifespan of an iPhone, makes an external battery iPhone case practically a necessity. This 7200mAh power charger will completely solve the problem of your phone dying throughout the day. It will double your phone’s battery life. In addition to being a good charger, it is also a quality phone case, with PC+TPU materials and a 360-degree scratch guard. Furthermore, you don’t even have to charge the battery separately. It automatically charges when you plug in your phone! With the code FLRWU9B9, Daily Dealer readers can get their very own for a full 66 percent off. The code expires November 30. Because of my bad history with iPhone 7 Plus battery cases I’m afraid if I write this review I will jinx myself and the case will break after I hit “submit”! The problem I’ve had is that they always break, usually at the point where the lightning connector is located on the case. I’ve had of three of them die within 2 weeks and I am not hard on my gear. This case has a flexible lightning connector and flexible top part that make it easy to take on and off of the phone so far eliminating the problem that all of my previous cases had. It charges fast and provides a lot of power for the phone. I’m a heavy iPhone user, especially for photography which means my screen is on a lot and at full brightness. This can run down the battery really fast but this case allows me to do a whole day of photography and videography without worrying about missing shots due to no battery life. With normal usage expect two days of battery power without having to charge it, no problem. As far as protection goes, this case, unlike many others that you slide in and leave the top part of your phone exposed, covers the entire phone with a protective rubber-like material. It even has a little lip around it that makes the case flush with the rounded design of the iPhone. The only complaints I have are that the case is heavy. Expect to double the weight and size of your phone. It’s ok because the extra bulk is worth it. The other is that using clip on macro/tele/fisheye lenses is a pain and in some cases impossible due to the fact that the case is ultra thin where the cameras are and then tapered to where the battery is. This means any clip on lens attaches at a funky angle messing up it’s functionality like depth of field for macro and creating black spots on the edges for other lenses. I usually take the case off for these things so the easy removal/Install of the case comes in handy. I highly recommend this case and will update my review if it goes dead like the others. Nancy Hugh says her phone never dies anymore throughout the day! My iphone 6S plus has never run out of battery even with heavy use. 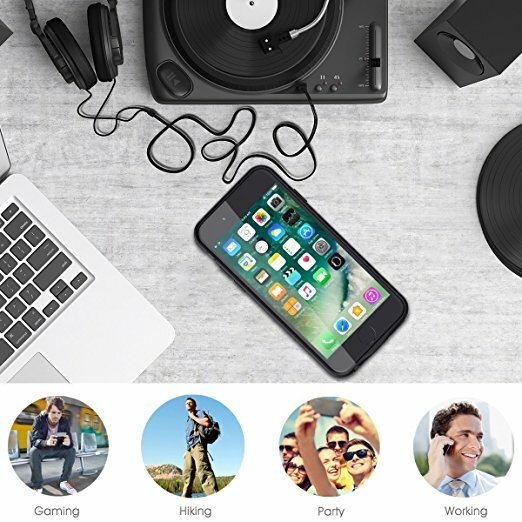 This iphone 6S plus charging case makes daily trips more easier. I would certainly buy this charging case again for my father. This battery case does very well as described. I never worry about my iPhone running out of power skip a day charging or forget to plug in the night for this high capacity case charge. It also protects my iPhone 7 plus very well even I’ve dropped it. would like to buy another one for my sister’s iPhone 8 plus. The jury’s in. With this iPhone charger battery case, your day will become so much better.